Take your green smoothies to the “minty side” with a little fresh or dried mint. It enhances the flavor and imparts some nice health benefits. Earlier this summer I harvested a boatload of three varieties of mint: Moroccan, apple, and water. I used a little bit of the fresh herb in smoothies and teas, but dried out the bulk of it. Now I have three little mason jars with each variety of mint to dip into whenever I make a smoothie. Honestly, I end up adding mint to more smoothies than normal because of how much I enjoy opening the jars and taking a big whiff. I haven’t had a cold in years and don’t plan on getting one anytime soon to try this, but have read inhaling mint is great for relieving congestion from the common cold, as well as sinus infections, asthma, and the flu. Someone will have to give it a try and report back. Not only does mint improve the flavor of your smoothies, it offers a pretty impressive list of health benefits. As a digestive aid, mint helps sooth the digestive tract, helping to relieve stomach aches, nausea, heartburn, and indigestion. You can use mint internally and externally to deal with skin problems such as acne and pimples. Mint helps cleanse the blood and eliminate toxins from the body. Mint is also rich in antioxidants, anti-fungal, anti-bacterial, and has a cooling and calming effect. 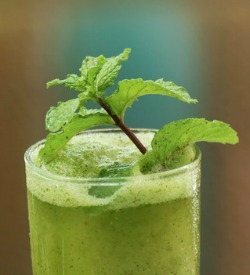 Mint goes great in green and chocolate smoothies, and combines well with my favorite green superfood supplement, Ormus Supergreens. Feel free to substitute another milk if you don’t have or like almond. Enjoy! Please leave a comment below if you try this delicious minty spinach green smoothie. Happy Blending! Delicious! Sweet and fresh. Thanks! Glad to hear you liked it, Anjani! I also add mint, grown in my garden, to my spinach smoothies. I don’t like to taste any spinach at all and the mint is amazing at masking the flavor. Nice!